A cross fold is also known as a right angle fold. It is made by folding paper twice: first in one direction and then, on a second pass, from the side. The 2 most common are these: the basic Cross Fold (fold in half then fold that in half from the side; and the Baronial fold (fold in half and then in thirds from the side). 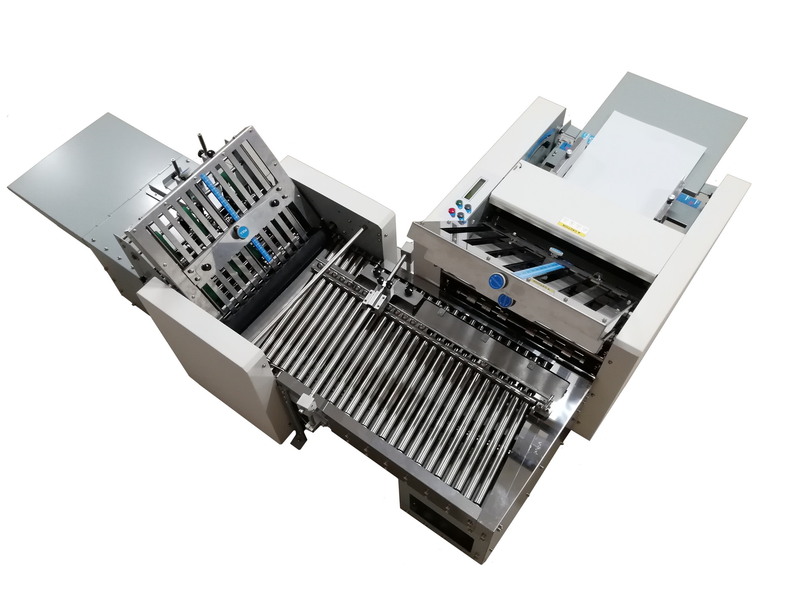 Most folding machines have 2 fold plate which allows them to perform 2 folds on a sheet of paper, normally in thirds, but as small as 1/4 of the sheet length. The smallest they can fold and perform a cross fold is into thirds. 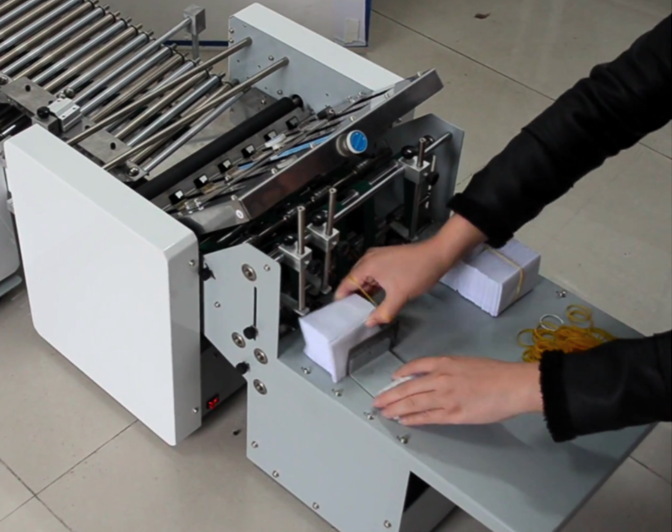 A different type of folding machine called a pharmaceutical folder has 4 fold plates, so it can fold paper into smaller sizes, down to 1/8 of a sheet of paper. However due to the thickness of the paper, the smallest cross fold they can perform is 1/6 of the paper on the first fold, then into thirds. So the smallest for a letter size piece of paper would be 2.84" x 3.7" on the more common 2 plate machine, but down to 1.84" x 3.7 on the 4 plate machines. PLEASE NOTE: NO MACHINE CAN FOLD MORE THAN ONE PIECE OF PAPER AT A TIME AUTOMATICALLY. THESE FOLDS ARE PERFORMED ON ONE SHEET OF PAPER AT A TIME. First are one pass systems. These Cross Folding Systems combine 2 machines at right angles connected by a conveyor. The paper is folded by the first machine and then fed into the second machine by the conveyor for the cross fold. 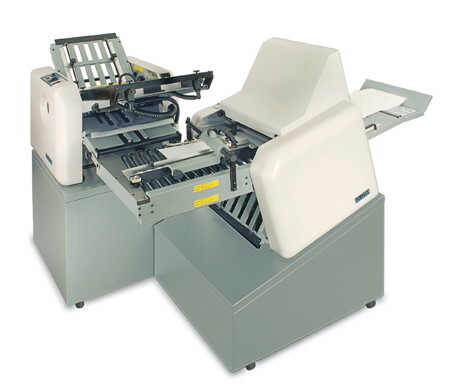 This is a one pass system capable of folding non-glossy paper into smaller sizes such as inserts into small packages. How? Because the first machine is a pharmaceutical folder with 4 fold plates that can perform up to 4 folds vs regular folding machines that can perform 2. So the first machine can fold paper down to 1/6 of its length vs. 1/3 for other machines. This is the machine to get if you need to fit the folded sheet into a small package. It also has an optional stacker that allows the operator to pause the machine and collect very small folds. This is a one-pass right-angle air-feed system especially good for high volume and/or glossy paper. It is very fast. It can cross fold paper into sizes 1/2 to 1/3 of the size of the paper. The other machines capable of performing a cross fold do it in 2 passes. You put it through once for the first fold, and then again from the side for the second. We have found that the listed machines work best for this use. They are designed to perform cross folds, but cannot fold either glossy paper or fold paper into a size smaller than 1/3 of the paper size. The Formax machines have a guide that aids in the second fold. All cross fold machines are listed below. They vary greatly in capabilities. Call us with your application for a recommendation.